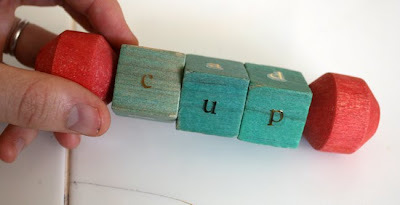 Almost a year ago I made a couple of DIY spinny spellers for my kids, because they were learning to sound out letter combinations and blend sounds to start reading. The spinny spellers you can buy are all upper case letters though, and I wanted something that was lower case, so I just used a bit of dowelling and some wooden beads and some letter stickers we had handy. It worked a treat and I agreed with my older daughter's kindergarten teacher that it would be a good tool for the classroom, so I've got a box of wooden blocks that her husband kindly cut and drill pressed holes in, plus a bunch of dowelling and all the left over wooden beads from a thrift store find, to make over 40 of these things. I'm hoping I can get my act together and find some appropriate letraset cheaply to put letters on all the blocks and varnish them. I was going to try this method (which is very cool), but with nearly 500 surfaces altogether, that would take my until the kids were in college! 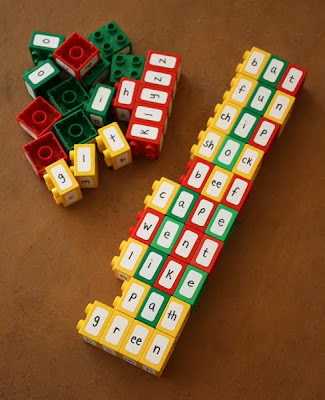 Anyway, as well as the spinny speller hackathon, I've ended up making a set of creative spelling/reading/story making blocks from our Duplo bricks. I wanted something with a bit more freedom than just the three blocks of the spinny speller. Something that could grow with the kids ability. We are lucky enough to have a good amount of Duplo because my mum saved all mine and my sisters, and we scored a couple of cool garage sale sets too, plus uncle Chris gave the kids a zoo set. Their dad stole a few of the bricks to make traffic lights for them a while back, but we still have lots we can use. The kids are now preferring more and more to build with the smallest scale Lego, but the Duplo still has so many possibilities for them as they get older. All I did was sit down one evening with a bunch of white stickers and write out a load of easy words. 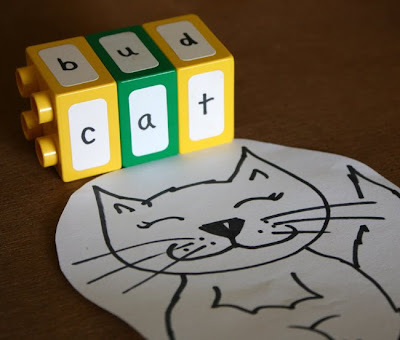 Sight words and words that my kids can already read or sound out. It took a while to write and cut them all, but it was very cheap, and we were lucky enough to have a mate we'd not seen in years staying with us that night, so we all sat around and chatted until about 3am while I stuck all these words on the blocks. For some of them I put the opposites on the other side of the block, like "love" and "hate" or "big" and "small" and for others I put complimentary words like "his" and "her", so that the kids could change sentances they made easily by switching around a block. I had a couple of long blocks, so used them for entertaining long words. The kids have enjoyed them a lot. We started out making story walls together, and then when left to their own devices they started making funny sentances stacked up vertically. For my younger daughter, who is four, I made another set that were in a different orientation, that would work a bit more like an extension to the spinny speller. They just had vowel bricks with a different vowel on each of the four sides, and consonant bricks with four consonants on each side. I also made a few bricks that had combinations like "ch", "sh", "th" etc, because she's learning those sounds in words too. I drew a load of pictures in black sharpie that the kids wanted to colour, then they sat with the letter bricks making the words that went with each picture. 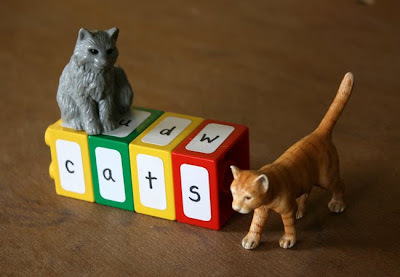 They also made words to go with pictures in books and little toys they have. Of course the Duplo bricks can still be used in regular building play, but this adds an extra learning possibility to the play. The really seem to like the idea of "building" a word or a sentance. I really think that Lego should just make sets like this. 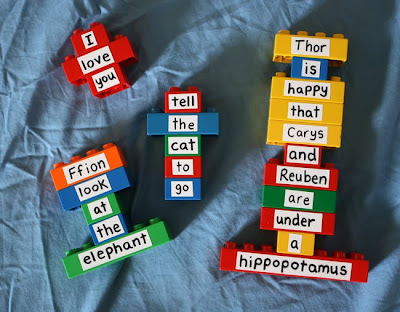 The kids were so into building with the words and it would be great to be able to buy grade level appropriate sets or character story telling sets. Limitless! 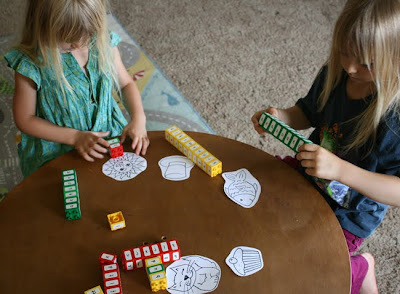 We're still having fun with all the card and hole punching Lego crafts from a while ago too. I should get my act together to post you some new vehicle kit print outs of something else interesting from our experimenting. This is frankly a totally awesome idea! It is one of those things that is so simple I know I should have thought of it myself, but didn't. Yet anoterh inspiring project to attempt. Wow. How absolutely wonderful. I will be looking for some duplo blocks the next time I'm on a charity shop spree. 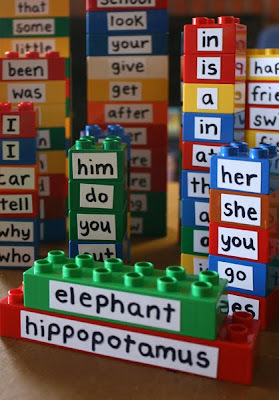 Your word/letter duplo blocks are just brilliant! I am going to use this idea with my kids. Thanks for sharing! And I have been throwing those Duplos away by the bucketful! Yikes! If only I had a fraction of your genius! I am holding on to them from now on and playing games with my 6 year old! What's particularly cool about the Duplos is that it does nothing to diminish their play value as intended. Every set of Duplos should be like these! Wow, brilliant! I have been looking for a lower case block set! Now, shall just have to convince someone to stay up until 3am to help me make one with our duplo set! Love it, thank you got such a wonderful idea! I totally just scored a huge bag of mega blocks from the goodwill for $5. 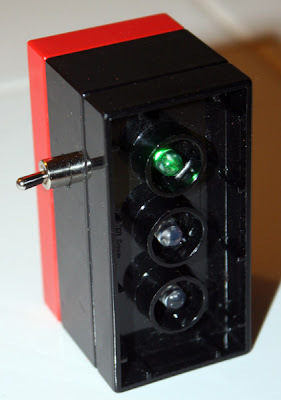 I think I am going to make some of these, and be on the lookout for the smaller duplos. What a great idea! Now I'm thrilled I still have these kicking around! My youngest (6) is an emerging reader. This will be so much fun! You just blew my mind :). I mean, really... who DOESN'T have some blocks like this that they could easily convert. This is the best idea I've seen in awhile! oh, my goodness how I love this idea for duplos! Fabulous! So Completely AWESOME!! I would stay up right now and do it to ours but the house is dark and everyone has gone to bed without me -- probably means I should get off the computer! I'll be sharing this with my favorite kindergarten teacher -- she's going to love it. Love. Love. Love this idea! Thanks for sharing! As an elementary teacher, this is AWESOME. I am definitely going to borrow this idea! Where do you come up with so much awesomeness? AWESOME! I don't have any duplo but I'll have to get some for this. I love it, love it, LOVE IT!!!! May I just say - genius! I love this idea and can't wait to find ways to use it. Thank you for a great repurposing idea. Love, love, love the word building! What about burning the letters into the spinning blocks? Those wood burning pens aren't too expensive, I don't think. As always, my friend, you are brilliant! I love your ingenuity. That is such a great idea! 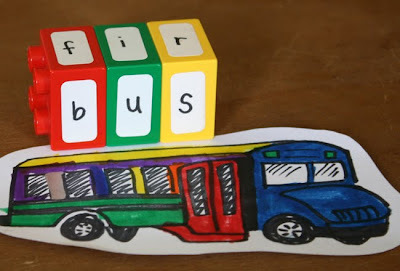 My kids had some shop bought game with words and they had heaps of fun making silly sentences - I thought it was really good, but this is so much better as they join so well and you can include some of your own special words. Love it! These are wonderful! :) Thanks for sharing your ideas! this is so awesome! what a great idea! do you have any ideas for empty dvd cases? i put mine in a big folder with sleeves. thanks! 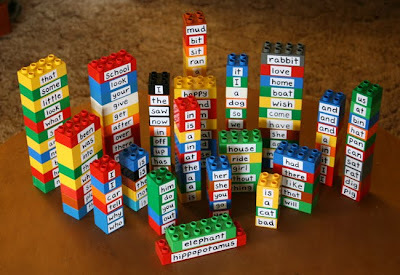 Do you have a list of words to share for those of us who would love to make a set of these wonderful reading Duplos? And would be nice to have a list of letters and combinations you chose for your blocks. Thanks so much! Look forward to your next adventure! That is BRILLIANT. My LOs still play with ours in the traditional way, but my oldest is beginning to read. I'll be working on this in the next little while! Thanks so much for taking the time to share all the photos too! I've said it before. You are a genius. Another AMAZINGLY simple, sweet, and brilliant idea! In the short time I have been following your blog, you have inspired me numerous times. I wanted to tell you how thankful I am for your creativity and for sharing your ideas with me, so that my little ones can experience the fun and love that inspired your activities. I am giving out 15 blogger awards and you are on my list. Visit my site to see it and to give out awards yourself. I like your idea for doing the individual letters! This is a great blog, btw! Thanks for the kind words y'all! It's great to hear that people are keen to give this one a go. Thanks for the ideas for getting the wooden spinny spellers sorted too. I've gone off the letraset idea after pricing it out, but I have got some indian ink and a set of rubber alphabet stamps in lower case, so I'm going to do a test out with that. Joan, I didn't have a list of words really. I just wrote them out as I thought of them. I think if you google "sight words" for various grade levels then you should get a few lists to work from though. The kids love having their names in the mix! and Erin, hello! So cool to find you're on the same wavelength! I love the idea of using this for rhyming poetry! You are a genius! This is a brilliant idea - so creative! 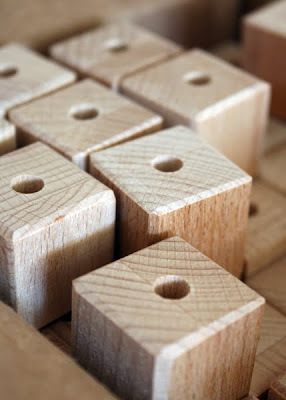 I made some spinny spellers a few months ago using wooden blocks (see my blog if you're interested in how I made them). I can't wait to give your version a try! Thanks for sharing this idea. Love this! I just may have to do this! Oh, how I ADORE your blog. I am so glad I found it and am amazed by your creativity every time I read it. I am jumping on the bandwagon and I left you a little award on my blog today too. I know you don't usually post on stuff like this, but I wanted to link to you so more people find out how awesome you are! By the way, how's that bug hat these days? I hope the girls still love it! COMPLETELY awesome, and perfectly in time for the mid-break brain melt. This will be fun! Thank you! Brilliant, as usual! I think I've said that every single time I've ever commented on your blog :). and thank you Bea too! Mari Ann, I love the colours you did your spinny spellers in. Very cute! This really is an irresistible idea. So much fun, and learning here. Well done! This is awesome! I love the idea of using legos. I was thinking about using an old scrabble game for word building (the tiles), but I like how you can connect the letters or words. Thanks. Thinking about schooling at home in the fall and this would be awesome for spelling! Where did you get the white stickers? Are they just cut up mailing labels? What a fabulous idea! I was wondering what I would do with the Duplos when my 4 year old demands to graduate to the smaller Legos. Such an awesome idea! My daughter is loving Duplo now...what a great extension. Wow, I don't normally leave comments on blog sites, but this is fantastic and I wanted to say so! Thanks for the wonderful ideas. so cool! I have a ton of alphabet stickers from my scrapbooking days. I am going to put them to use on the duplos/legos that my kids aren't playing with anyhow. stolen! I love this! can't wait to sticker up our duplos! Thank you! Okay I was just complaining that nobody was buying my duplo blocks from craigslist. I am hereby deleting my ad and creating these cool word blocks you made. Thank you so much for this idea!!!! Brilliant! My son would have love these when he was younger. I think I am going to work these into spelling this year. This is awesome! Definitely need to try this out for my lego loving boys! I love everything you do. You really inspire me so much! As a stay at home mom I feel such a responsibility to teach my kids creativity, independence, etc. I love this and think that you should sell your idea to legos. You need to earn big bucks with this idea! Or maybe you could patten it yourself? 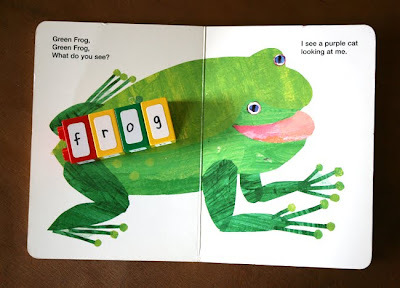 It's a reading blog dedicated to early literacy and these ideas are perfect. You know that's really quite genius, right? Have you thought of writing to Lego? It's brilliant, and highly marketable. Thank you so much for sharing with us. 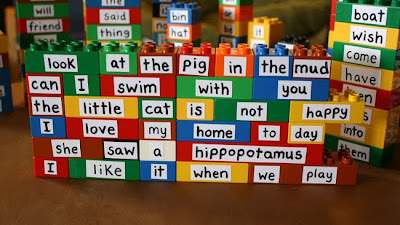 Earlier today I seen this project on another blog, but with just the bigger blocks and whole words. I think the individual letters is even more genius because, a child can really dig in to the components of a words instead of being thrust upon the entire word. 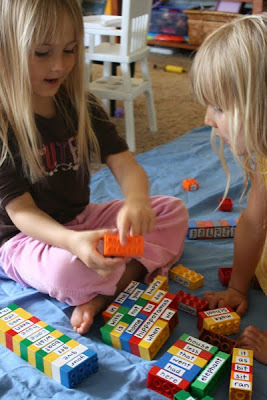 Love the duplo block idea! These are wonderful ideas for words - but don't forget math. You could put numbers and pictures or dots for children to match for number recognition. You could do numbers and plus or minus and equal signs for them to begin basic math. Match up the numbers into an equation and pair it with dots in an equation. For older students, it's a great manipulative for learning their times tables. Thanks - I'll be looking for duplo and lego blocks now. Great idea! Reminds me of "Magnetic Poetry" only in 3D. Genius. Pure and utter geniosity! I don't have any duplos and have no access to them (I live in Ecuador where ten legos cost something like 20.00), but I could not help but stop by an express my appreciation for this project. I love this idea and will be using it with my children! Thank you for sharing! 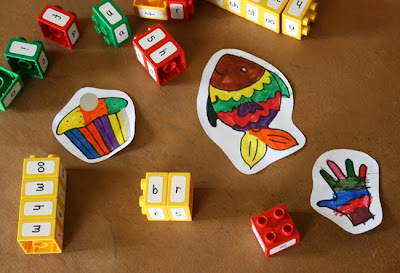 My daughter (your daughter's teacher) sent me a link to your blog...I am a preschool teacher and just love all of your ideas...especially the scaffolding with Legos (alphabet and hole punch). Thank you. I will be following your creative ideas. This is the best and most awesome idea ever! Yes it's one of those things that is so simple anyone could have thought of but didn't LOL . 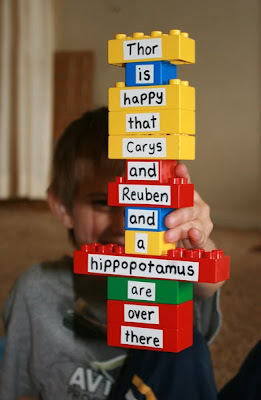 Thank you I am keeping my duplo now ... my boys are just 4 but what a super project to start them reading. This is one of the most genius ideas I have ever seen! Thank you for sharing it. I'm going to have to bookmark this page so I can do this wthl Little Moo's mega blocks when she's ready to start learning to read!! WOW. thanks for sharing...awesome idea! I. LOVE. THIS. Thank you for this amazing idea!! That is just clever! Thank you for sharing. I'm gonna need some duplo bricks now. Thanks again! Quick! Patent your excellent idea! I stubbled on to you and OMG what a wonderful idea!!!! I was just wondering what to do with all of our Duplo now that legos are moving in and now I know!!! THANK YOU!!! I thought this was such a great idea I sent a link to the post to mu son's speech therapist. 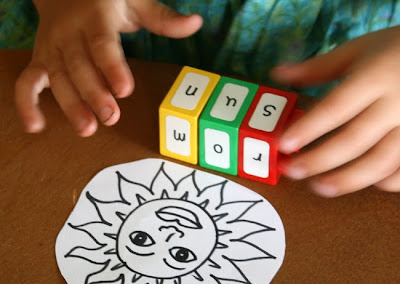 What a great way to help kids practice troubling sounds and letter blends while they relax and build. Not only will our blocks get a makeover but I bet this goes to class soon! I love your ideas! Thank you for this simple yet powerful idea along with the time you have taken to write about it and uploading the pictures, you have helped a lot of people and positively encouraged language acquisition for an even larger number of people. Both fun and educational. Exactly what i need for my 5 years old. .....now I've got to dig some duplo blocks out the bottom of the toybox! Thank you for sharing this INCREDIBLE idea!! 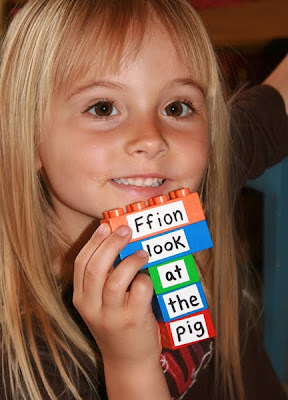 What an absolutely fantastic idea - I cant wait to do this with my duplo bricks. It will be so useful for the reception children I care for plus the under fives. WHAT A GREAT IDEA!!!!!!! Thank you!!! I'll be pulling out the Duplo I had ready to give away!! I'm so excited! Most impressive, thanks so much for this amazing idea. Totally cool. Our pre-k kids will love these. 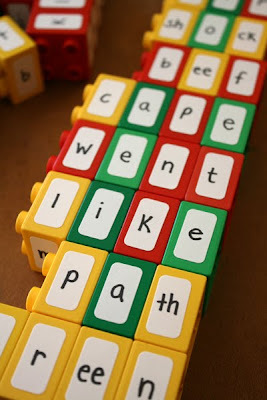 Love, love, LOVE the duplo idea! I think it's even worth buying MORE duplo blocks at thrift stores or garage sales just for this project! Brilliant! I had to pin this; hopefully I can find some bricks that my kids won't mind me using for this! YOU are so smart! I love it. I have a bunch of those just sitting in a toy box, and I think I'll give this a try. Thank you. This is GREAT! I would love to share a link to your post on my blog, but would like your permission. Thank you. Cannot wait to do this. Thanks for sharing!! Do you mind me asking where you found the blank stickers? Fantastic! Thank you for sharing! I've pinned this! Brilliant! Wish I had more duplo!!! I was reading all the posts and thought how cool this would be for early elementary classroom and then it hit me .. this would be great for ELL students. We have an ever increasing population! It could also be used for subjects and predicates if I use the long legos! :) One more thing to add to my ever growing list of great ideas from the blog world! I found this via Pinterst and it is AMAZING!!!! I hope to become an Educational Assistant after colledge, and this is something that I am keeping in mind!!!! :) Thanks so much for sharing!!!! This is so creative. Learning should be this fun! LOVE these ideas! We're putting words on our blocks today. I never post comments on blogs, but I had to tell you how amazing this idea is! 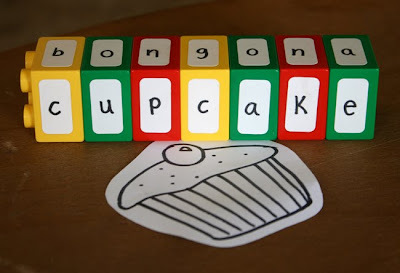 I teach special education and will be creating these for my students to help them learn to spell. Thank you for the great idea! Thanks for such a great idea. I'm doing it right now. My husband said to me why don't you just use the labeller. Sometimes he has a good idea or two. It worked great. Thanks for the great idea! I'm a teacher of special needs students and some of them don't know their basic sight words. What a cooler way than to have them build with them! I would love to use your idea and put our high frequency words on them for my literacy group. They would love it! What a fabulous idea. I love your creativity and practicality! I absolutely LOVE what you have done with the duplo blocks! Do you mind if I post your photos with credit to share ideas on pinterest? Thank you! Didn't have any Duplo, but my DH found a large tub of Mega Blocks that work just as well. I also added punctuation to the single orange ones to make complete sentences. Also made some words with a capital first letter for the start of sentences. I'm a special ed teacher and love your idea! So do my students. Thank you!! Just saw this on Pinterest. GENIUS! Now I'll be saving all of our duplos. I have a 2YO who loves them, but I know she'll eventually move on to the LEGO bricks, which we have literally tons of. This gives me an idea, wondering if I can do anything with some of those. Hmmm? Anyway, thanks for these wonderful ideas!!! Hope it is OK to repin! I know this is quite an old post but I found this page about 8-9 months ago. I made some re-purposed blocks at the time and have found them to be very helpful and fun these past few months. Thank you for the inspiration, a wonderful idea! Need to make a note for my children. Love this, love this, love this! Thank you for sharing your idea. I will definitely be copying it for my young ones! Thankx for the idea i'm going to use it in my class! Greets from Belgium!